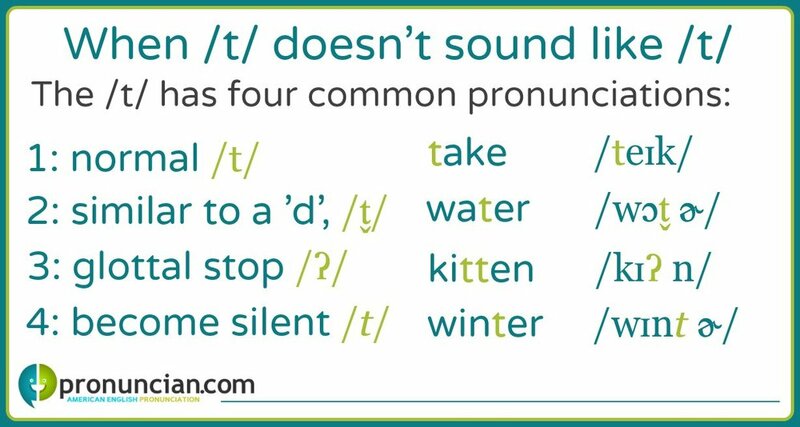 The /t/ has 4 different pronunciations: 1) a regular /t/ (take), 2) /t̬/ (like a 'd,' as in water), 3) glottal stop /ʔ/ (kitten) 4) become silent (winter). Most sounds of English do not have one exact method of production; small variations of sound (called allophones) are often so minimal that native speakers of a language often barely notice their existence. Which allophone is used depends on adjacent sounds, placement within a word, and if the sound is within a stressed syllable. While native speakers use allophones intuitively, non-native speakers benefit greatly from explicit instruction on the subject by increasing their listening comprehension as well as being perceived as more fluent speakers. Studying allophones is complicated by the fact that most dictionaries do not show allophones in their transcriptions (the symbols they use to represent sounds). Instead, most dictionaries use a single symbol to represent all allophones of a sound. Learners who wish to fully understand allophone usage should refer to dictionaries that specialize in pronunciation, such as the Longman Pronunciation Dictionary. The /t/ is a regular, aspirated /t/ when it is the first sound of a word or a stressed syllable (or does not fit into patterns 2-4 below). This rule overrides all other /t/ allophone patterns. In the examples below, the /t/ is pronounced normally because the sound begins a stressed syllable. The alveolar stop /t̬/ sounds like a quick /d/. It occurs when a /t/ is between a vowel sound or /r/ (including all r-controlled vowels) and either another vowel sound, /r/ (including all r-controlled vowels), or a syllabic /l/. This lesson, plus more exercises with examples of alternative ''t sounds' is in Pronunciation Pages. The /t/ is pronounced as a glottal stop /ʔ/ (the sound in the middle of the word 'uh-oh') when it is between a vowel, /n/, or /r/ (including all r-controlled vowels) and followed by an /n/ (including a syllabic /n/), /m/, or non-syllabic /l/. An italicized /t/ means that the sound can be silent—or omitted—from a word. This /t/ allophone varies the most widely among native speakers, and even within a single speaker's speech patterns. The /t/ is less likely to be omitted when the speaker is emphasizing the word for an reason. Also, among all the /t/ allophones, this usage can be considered the most informal and non-standardized. There are two scenarios where the /t/ is often omitted. Scenario 1) The /t/ is optionally silent when it follows /n/ and precedes a vowel sound, /r/ (including all r-controlled vowels) or a syllabic /l/. Scenario 2) In addition to the above instances of omitting the /t/, it is often omitted when it occurs between two consonant sounds (except the consonants specifically mentioned for /t̬/ and glottal stop). This is likely to occur when an -s ending is added to a word.